A happy day in the bee yard last week. The good weather allowed me to keep chipping away at my end-of-season inspections. I like to make sure that hives are queen right, adequately provisioned, and well-organized before the fall rains prevent me from opening them. While hive checks this time of year need to be short to forestall robbing, I couldn’t resist taking a quick photo of this 2-deep 2013 colony. 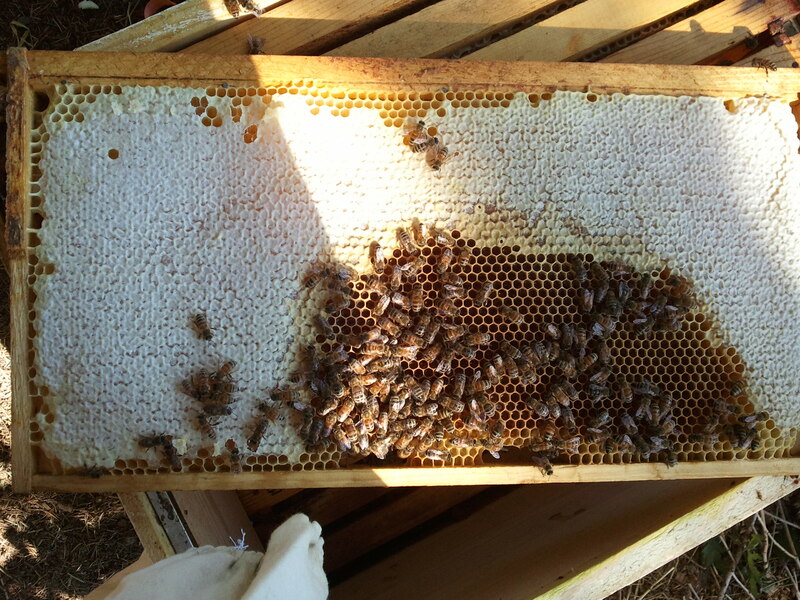 The dark cells in this frame are former brood cells now filling with curing honey. With any luck, the bees will have back-filled much of their brood area, giving them plenty of stores for winter and early spring. I usually overwinter hives in one deep and a western, but this colony was so populous that I had a hard time squeezing it all into that configuration. Good job, bees!